How Does a Coverstitch Machine Work? 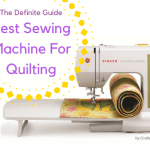 How to Choose The Best Coverstitch Machine? Which Projects Do You Plan To Handle? There are no second chances to first impressions. When it comes to making an impeccable first impression, nothing should go wrong, especially not the hem of your outfit. Whether you’re a high-end fashion designer, a tailor, a stay-home mum or just another American going by, we’ve all experienced a badly-done, fraying hem on a dress, shirt or a pair of pants. It is distracting, to say the least. No matter how simple or great an outfit is, the quality of the finishing is everything. It takes paying attention to detail when making those final touches, which may seem like a ‘luxurious’ task for those with time to spare. Going that extra mile is a worthy addition to the dress you’re making for yourself, for a loved one or sale. What more? You can get the best coverstitch machine in town to do the hard work for you. The first time I had a look at this machine I thought to myself “What’s a printer doing in a clothes store?”. Well, after putting the ‘printer’ to the test and seeing that it was not chunking newsletters, I changed my view. 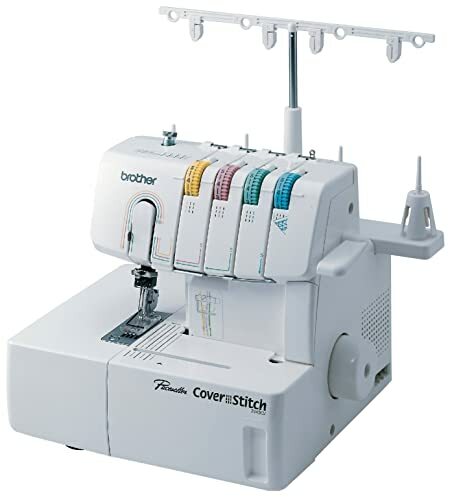 This Brother coverstitch machine can comfortably do a variety of stitches. These include the double chain stitch, flatlocks, the tri-cover stitch, utility stitches as well as the decorative zigzags to name but a few. The Brother 2340CV machine is one chunky machine in its design, but it makes up for it with a lightweight 15 pounds weight. It has 11.8” * 11 * 13.4 dimensions meaning that you have the rest of the work space all to yourself. If you’re worried about speed, this Brother right here will sort you out with its SPM (Stitches per minute) of 1000 which is pretty good. Talking of speed, to get the hems right, the front and rear feed dogs must be controlled. The slider level adjustment guide caters for that. 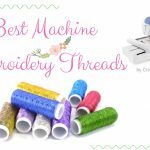 One thing that beginners will appreciate about this machine is the color-coded threading guide that makes needling and looping very straightforward. Another plus is the special presser foot that snaps back into position after use. Users have complained that the harp space is too small. Prepare to roll up your fabric every time you start a new project. Also, the machine doesn’t have a free arm-major buzzkill. 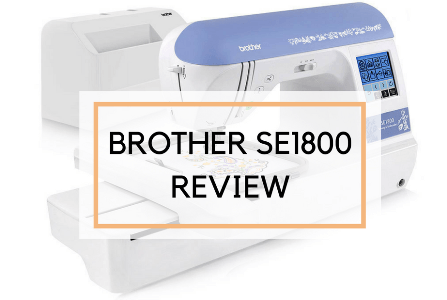 The Brother 2340CV does impress as the best inexpensive coverstitch machine for quilting. I would buy it, but the fact that it lacks a free arm is a major turn off for me. Try your luck. The Janome 1000CPX is an advancement to its predecessor, the Janome 900CPX. Going by the reviews of this machine, it has won love and hate in almost equal measure. A glance at this machine won my heart immediately as it pulled off the trustworthy traditional, industrial sewing machine look. The Janome 1000CPX, however, is a homemade machine that does nothing else other than make hems. 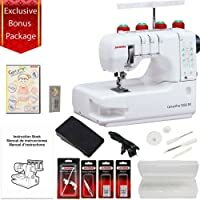 The Janome CoverPro 1000CPX beats the Brother 2340CV coverstitch machine by having a long free arm that makes it possible to sew while hemming. It goes further to outshine Brotherman thanks to its large harp space that eases laying of fabric and related tasks, i.e., placing a cup of coffee at the side while you sew. Don’t get it twisted. This machine is not all luxury. It also has a removable extension plate which provides extra room in case the fabric is too large. Reviewers of this machine have raised the issue with the fact that it skips stitches especially on thick fabrics like cotton. Not all of them though, as others like me concluded that it’s simply a matter of dumping the cheap threads for the high-quality thread. 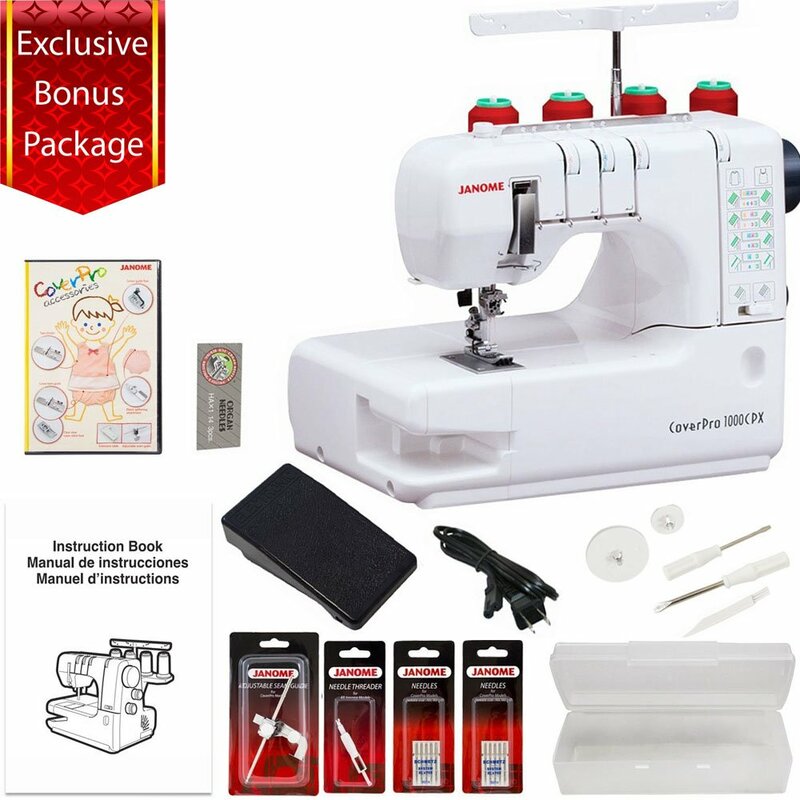 The exclusive bonus bundle aside, Janome Cover Pro 1000CPX ranks as the best coverstitch machine for many users. I recommend it to all willing buyers! Juki has made a reputation for itself in producing some of the best machines on the market out there. The Juki MSC-1500 is yet another addition to their long resume. In appearance, the MSC-1500 Cover Stitch is compact, and the design is not as complicated as that of the Brother 2340CV. 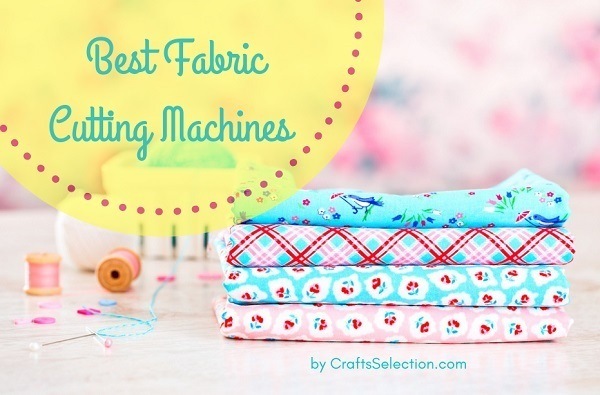 This machine mainly does cover stitches for sleeves, armholes, necklines and simple hems. Making chain stitches on the waist and side seams of pants is also easy as A B C with this specialty device. 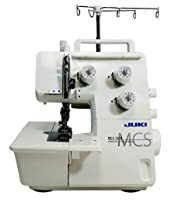 The first thing you’ll notice on this Juki MSC-1500 cover stitch machine that misses on most of the others is the exterior thread cutter for removing unnecessary pieces of thread while or after sewing. But that’s not where the uniqueness stops. On the side is an extension plate with seam guidelines, clearly marked to help a beginner or expert in maneuvering the edges. Sewing right means having your needles at the correct pressure setting. Juki knows this because it has an adjustable presser foot that allows you to change the pressure to a setting fit for the specific type of fabric. The adjustable differential feed marked on the knobs on the front of the machine also allows you to control the stitching at whatever speed. The presser foot which comes with a guide is placed at a higher position so that you can place your fabric hassle-free. The coverstitch machine reviews that I’ve come across indicate that threading the Juki MCS-1500 with new spools can be a headache. If you’re an amateur in sewing, I’ll advise that you exercise enough patience. 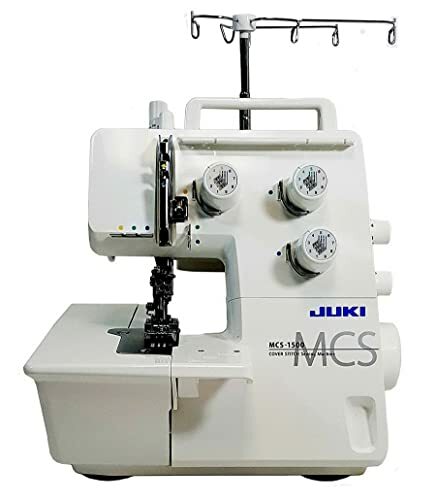 From my experience with Juki products, you can trust this machine Juki MCS-1500 to be a lifelong sewing partner. It is solid and durable. Once you get through the high learning curve, you will enjoy using it. When I first saw the Brother CV3440, the first thing that came to my mind was, “Wow! That is a thing of beauty.” But that attributes to only a tiny portion of this machine’s appeal. With its 6.1” by 3.9” workspace, this machine provides the largest space that any Brother cover stitch machine can provide. This comes in handy when you are working on large quilting projects. When you first get the Brother CV3440 you will quickly realize that it has a lot to offer. For instance, it has a convenient LED light that illuminates the workspace without putting out any of the heat that is usually released by a standard light. What’s more? It comes with a convenient thread cutter for greater efficiency. 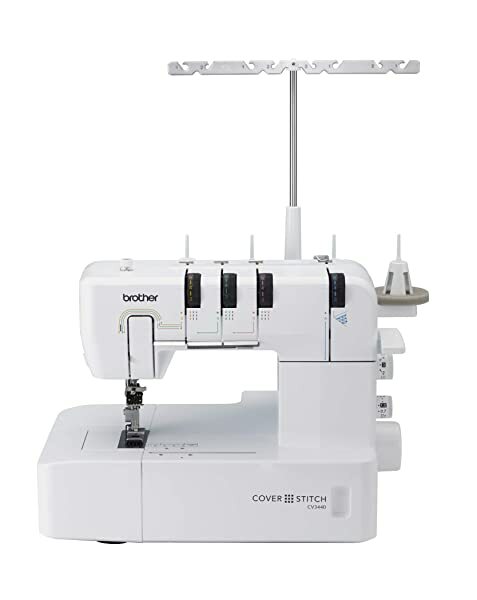 If you love quilting or constantly have to work on cuffs and hemlines, you will be thrilled to know that the Brother CV3440 features a free arm that will make your work significantly easier. Another amazing feature of the Brother CV3440 is its one-touch release lever that makes removing fabric really easy. As if that isn’t enough, this machine also sports a convenient color-coded threading guide. 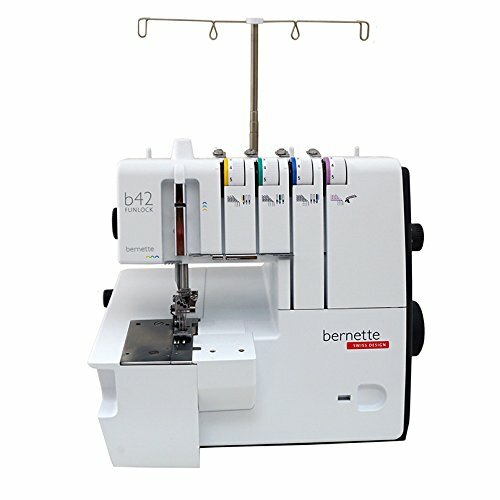 Some of the accessories this machine comes with include a hemming set, a belt loop guide, a bias tape binding set and a dual function fold binder. While the Brother CV3440 is in many ways similar to the 2340CV, it is better in the ways that matter most. It has a free arm and a large working space; features that the later doesn’t possess. If you are looking to invest in a Brother coverstitch machine this year, the CV3440 is the best option. If you are looking for a good coverstitch machine that won’t break your bank, there is no better choice than the Bernette b42 Funlock. This machine comes with 3 different coverstitches and a chain stitch. These allow you to flawlessly create edges, cuffs and hems. Due to its looper threading mechanism and separate needle threader, threading the Bernette b42 Funlock coverstitch machine is very easy. Moreover, it comes with ample working space and an LED light that makes working with it very easy. Even when you are dealing with stretchy fabric and thin knits, the Bernette b42 Funlock is still able to produce professional stitches. Like the Brother CV3440, this machine comes with color-coded threading path. However, it doesn’t come with a free arm or any of the more advanced features of the Brother CV3440. This is not surprising considering that its price tag is way lower. Some of the accessories the Bernette b42 Funlock comes with include a standard presser cover foot screw driver, a brush needle set, four spool caps and four oiler spool nets. Although the Bernette b42 Funlock is undoubtedly not as advanced as the Brother CV3440, it offers a lot of features for its price. If you are looking for a good bang for your buck, this is your best bet. Think of a coverstitch as the “Mr. Fix-it” of cloth-making machines. All coverstitch machine reviews out there have described it as a special sewing machine. They are not wrong since the coverstitch machine addresses a specific issue, and that’s giving your fabric the perfect hemming. 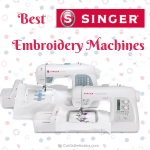 While some coverstitch machines may look like your regular sewing machine, the gist of it lies in the type of stitching they do. The coverstitch machine itself is a master in its trade. To identify a coverstitch machine, check whether it has one looper and no knives. Creating a coverstitch, which is the most basic use of this machine requires two rows of needle thread and a looper thread. The looper joins the seam to the hem, forming an intricate thread pattern. The result should be this: two plain stitched rows on the outside and two stitched rows inside with an overlock stitch connecting the two. All you need for this exercise is two good needles that are up to the task! How to Use a Coverstitch Sewing Machine? A chainstitch, another genius product of the coverstitch machine, uses only one needle. In this case, the end product is a straight line on the outside of the fabric and a beautiful chainstitch on the inside. When you buy this money-maker, there are attachments that come with it. The presser foot is one such attachment. It could be a gathering foot, a sewing foot or the cording foot. While you’re doing a gathering hem or making pin tucks, you’ll realize just how handy (or should I say footy?) the presser foot is to your work. 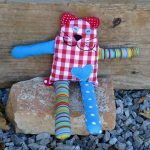 Other accessories include a removable guide used in making topstitches around banded edges and binder attachments that wrap around the cut edges of the fabric while coverstitching. Though a tad pricey, binder attachments come in a broad array of widths and fold arrangements and they could be the magic you need to get your hems perfectly done. Given to a layperson, a serger, coverstitching and sewing machine may look like the same thing. It takes a keener look and probably some testing to know the difference. The most basic of the three is the good ol’ sewing machine. It’s faithful as ever, doing all your stitches whether utility or decorative. For all your embroidery needs, mending wears, quilting or darning- the sewing machine will deliver. 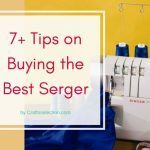 The serger overlock machine, on the other hand, is another “specialty” machine that takes the sewing beyond your usual conventional stitches. Its main use is to give a professional finish to the insides of garments. 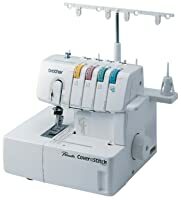 Unlike the coverstitch machine which does not have a knife, the serger has a knife for cutting seam allowances. This one is a heavy-duty performer that can use up to eight thread spools. 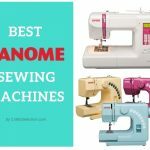 Its praises are many, yet it cannot replace the sewing machine as it can’t handle crucial stitching tasks such as buttonholing, making facings, topstitching and making zippers. Sergers can easily substitute cover stitching, but from our experience, a single machine for separate functionalities is better. There are combo models out there where a serger does the hemming, but this task turns out to be bulky especially when you’re working on a large project. Often you have to remove the serger’s knife and adjust the stitches which consumes too much of precious time. A coverstitch machine is a real timesaver when you want to work fast and glamorous at the same time. After comparing the prices given in coverstitch machine reviews and those of twin needles, the discrepancy is evident. Twin needles are way, way cheaper. For someone who’s looking to occasional stitching, the twin needles are a better investment. However, there are other factors to consider. Twin needles are not as compact as a coverstitch machine so that they will break easily. Apart from that, you will have to loosen your bobbin every other time while stitching to avoid tunneling. This plus the fact that you have to be on the watch out for the exact needle for a particular fabric, unlike the coverstitch machine which can swap spools from the sewing machine. The best way to create a secure and durable seam on fabric is to use the coverstitch machine. Simply fold over the hem of the fabric to the wrong side and then foot on the presser foot start working your machine. In the process, the needles should be pinned down on the cut edge of the fabric. Once you reach the desired end, you simply raise the presser foot so that the needles are in their highest position. Pull the material gently away from you and assuming you locked the end of the seam, the last bit is just cutting the thread and you’re good to go! Getting your way around the neckline, sleeve or skirt hem using twin needles is one hell of a job. The coverstitch machine, however, offers to give you a breezy time. Well, the first point of information about a round hem is that it’s simply a basic flat hem. The only difference is that you have to add a couple of stitches on the beginning stitches after you’re done rotating. Using a hem guide while doing a round is crucial in ensuring you make an even seam and avoid puckering. Whether it’s on the fabric, the binding or elastic, we cannot run away from topstitching-shirts are the biggest culprits of this type of stitching. 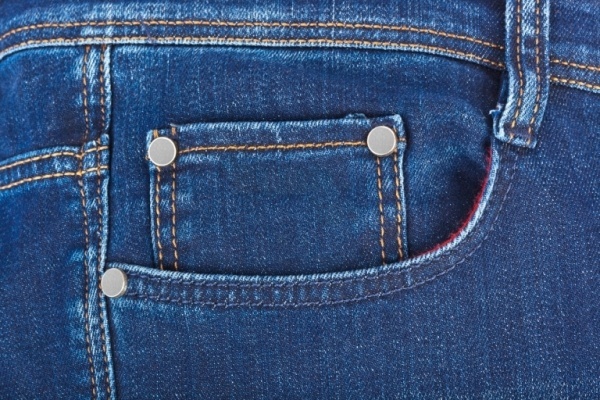 To get that neckline right or if you’re looking to add some decorative pizzazz on your favorite pair of jeans, then a coverstitch machine is what you need. Elastics and bindings are excellently done using a coverstitch machine so long as you get the needle settings right. Using the chain stitch, you get yourself a well-laid lacy addition to your lingerie for zero effort (okay, maybe a little effort). Read more: How to Sew Lace? 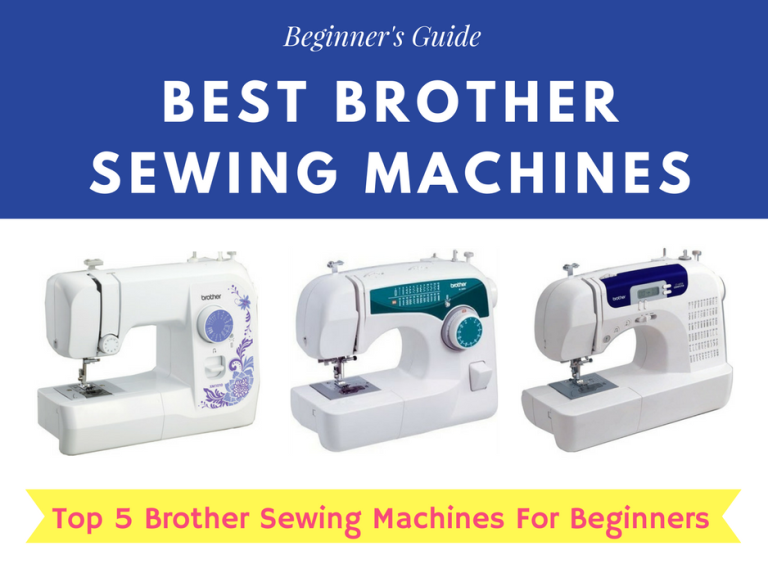 If you’re a beginner in the sewing business, you don’t want to go for a machine with too many frustrating features. Leave that to the experts. 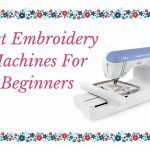 The best coverstitch machine for you is one that will grow your skills in doing basic stitches while giving you a chance to learn. If you’re in the advanced stage, then you are at liberty to take a sturdy machine for long-term use. A coverstitch machine is only a worthy investment if it meets your specific needs. If for example, you’re not a regular user, buying a machine with costly attachments is a waste of money. The occasional projects would call for a reliable machine for your specific want. 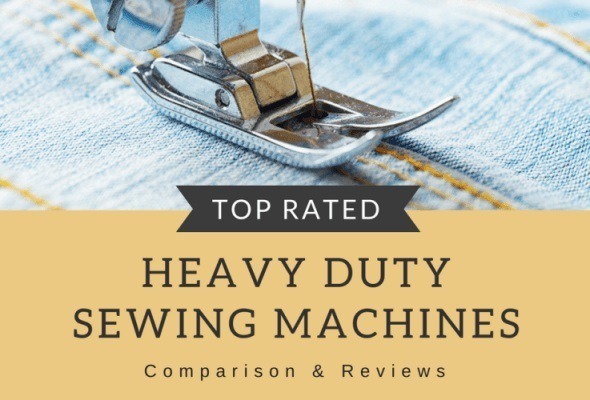 An expensive heavy-duty machine, on the other hand, would be valuable to the regular user who’s looking to produce high-quality seams. 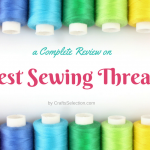 A sweep at the coverstitch machine reviews online and you’ll realize these babies are good for different uses, despite the fact that they serve the same purpose. Some machines are better for designing and dress-making while others are more effective in making repairs. It is therefore important to pick on the particular features of these machines when choosing, i.e. free arm or none. Accessories that come with the machine may turn out to be more important than perceived. A well-packaged product should come with a comprehensive instruction manual to guide you on the use and troubleshooting of the machine. Other accessories for a coverstitch machine are a repair and cleaning kit and a seam guide. Some machines are more material-friendly to certain fabrics than others. This depends on the needles and the threading that the machine uses. Very thick layers of knit and georgette will require a machine an adjustable differential feed that has a high enough setting. Other fabrics such as lace are thinner. The presser foot should be adjustable to help in controlling the stitching process to avoid puckering. 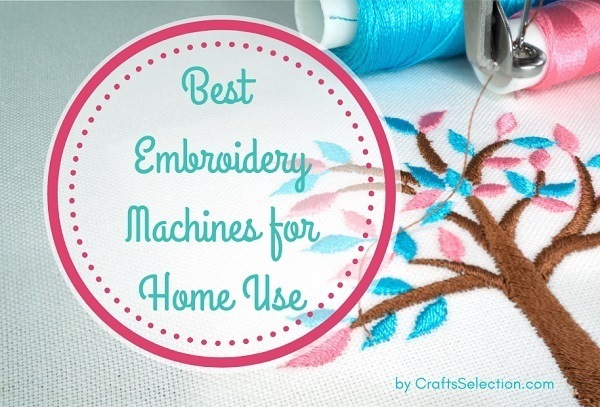 See also: How to Choose The Best Heavy Duty Sewing Machine? 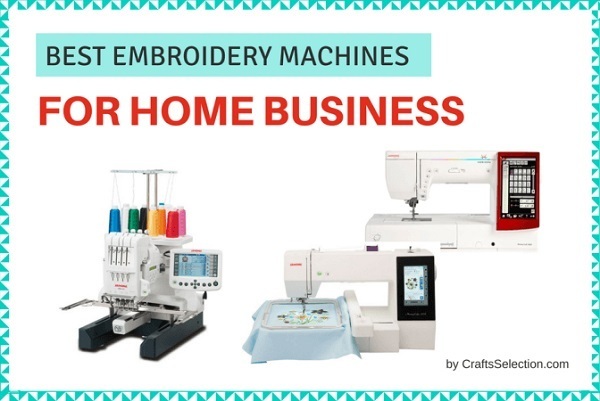 Some established manufacturers such as Bernina, Brother, Juki, and Janome have been tried, tested and proved to make the best sewing products in the market. Most likely their coverstitch machine is just as good. New brands tend to have more trial errors while others, in retrospect, may surprise you with wonderful products. At the end of the day what matters is that you get value for your money. Getting a coverstitch is no extravagant move, once you consider the time and energy you’ll save using it for hemming instead of overworking your serger. The Janome 1000CPX is definitely the worthiest investment of five options above. This is because it has the simplest threading process and it works pretty fast once you get that right. The only challenge is that you might have to dump the cheap thread for a high-quality thread which…You guessed right, is pricier. Once you settle the additional costs here and there, you’re well on your way to living every sewer’s dream. 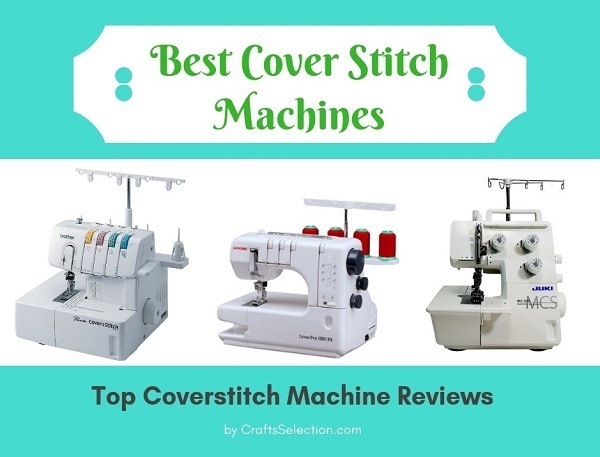 The best coverstitch machine will have you covered, rest assured.